On Saturday August 18th, volunteers come together on the iconic Marginal Way footpath to remove the seed pods of Black swallow-wort to contain the spread of this aggressive invasive plant. We meet at the Lighthouse at 8 AM, break up into small groups led by experienced pod pickers who will show you what to do. No experience is necessary. Pods and vines are collected in trash bags and are taken to the Transfer station for incineration. You are not only helping to prevent native plants from being smothered by this vine , but you are also coming to the aid of the Monarch butterfly. Swallow-worts are related to the milkweed family. A Monarch may lay its eggs unknowingly on a Swallow-wort leaf, but when the larvae hatch and start to feed on their ‘host’ plant, they all die because these leaves are so toxic. We have introduced a biocontrol insect onto the Marginal Way, the first site approved by the State of Maine, but it will be many years before this method of control has any significant effect on this plant. In the mean time, we will continue our ongoing efforts to gather seed pods to slow the spread of this insidious invasive. 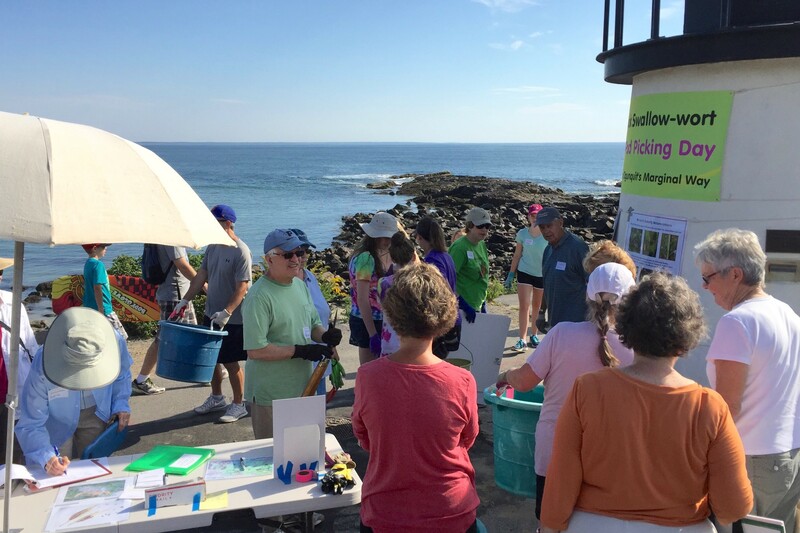 Another volunteer said: “This will be my 4th year volunteering…Each year I learn more about the invasive plants threatening the Marginal Way. At the end of the day, it’s rewarding to know that you’ve done your part to help preserve such a treasured seaside path.” ~ Lynn B. Come for one hour, or for three hours. We provide water and snacks. Stay afterwards for the hotdog cookout at 11AM and get to know other volunteers. Recommended: A hat, garden gloves (we have some if you need some), hand clippers (useful if you have a pair). Also: long plants and long sleeved shirt (protection in case you encounter a bit of poison ivy). Rain date: Sunday August 19th, 8 AM.